(Last Updated : 25.03.19). Haryana Staff Selection Commission (HSSC) has issued a notice regarding Physical Verification of PRT against Advt. o. 02/2012 Cat. No. 1&2. Before this, Director, Elementary Education Haryana, Shiksha Sadan, Panchkula had issued a notice regarding counselling of new Selected Candidates in both lists for the post of Primary Teacher, Cat. No. 01 & Advt. No. 02/2012. Here is the latest schedule for verification of thumb impression and signature of the candidates who are selected for the post of JBT/PRT against the advt. no. 2/2012. 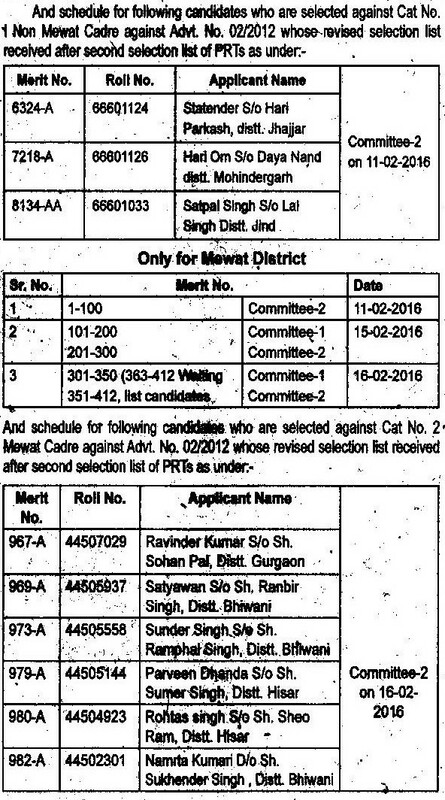 Candidates who have been selected in both lists (Mewat & Rest of Haryana) for the post of JBT against Advt. No. 02/2012 were invited for counselling (to fill option form) on 24.07.2018 at 11.00 A.M.
All related candidates should bring their Adhaar Card for Identity. If they do not have Adhaar Card, they should bring Passport, Voter Card or PAN card etc. and three recent passport size colored photograph (without spectacles) and present according to scheduled date at Directorate, Elementary Education Haryana, Shiksha Sadan, Panchkula. If any candidate fails to verify his/her Thumb Impression, Signature & Photograph or does not present according to the schedule, his/her selection will be rejected. All absentee candidates can appear for verification on 25.04.2018 as per the schedule given in the notice. Director, Elementary Education Haryana, Shiksha Sadan, Panchkula on 11.08.2017 canceled candidature of 520 new selected JBTs due to absent in Thumb Impression or Signature Verification. The Dept. (on 29.05.2017) had given another chance to all absentee candidates for Verification of Thumb Impression & Signature for the post of Primary Teacher (advt. no. 2/2012). Verification was held on 20.06.2017 for these absentee candidates. Earlier the Department on 10.06.2016 released Verification schedule (22.06.2016) for the absent candidates of JBT/PRT (Advt. No. 02/2012 and Category No 1 & 2) for verification of Thumb Impression, Signature and Photo of the selected candidates. See the details below. The Punjab and Haryana High Court on 13.03.2015 rejected these new selected JBTs' plea to join them during the verification process. The court made it clear that these 9870 JBTs will be joined only after the verification. No candidates will be joined without verification. So, now these new selected primary teachers will have to wait for their joining until the verification process is completed. It is notable that these new selected JBT candidates were selected in the previous Govt. of Haryana and had been demanding their joining for a long time. 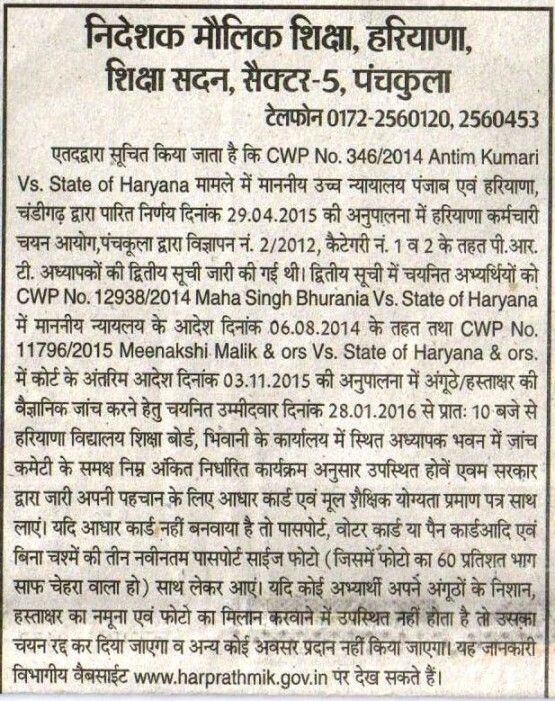 The Department has taken this action in order to follow the directions of Ho'nable High Court of Punjab & Haryana's orders in CWP 12938/2014 dated 06.08.2014 - Mahasingh Bhurania Vs Haryana Govt. & Others. Verification Schedule 2016 for Mewat & all those candidates who are selected against Cat. No. 1 (Non Mewat) & Cat. NO. 2 (Mewat) against Advt. No. 02/2012 whose revised selection list received after second selection list of PRT. What is the schedule of remaining candidate who could not attend verification of jbt for non mewat district? Is there anyone who know the schedule of remaining candidate who could not attend verification of jbt for non mewat district?